Let’s face it … when it comes to help with managing money, there’s a lot of competition out there, and account holders have plenty of choices. Each state has a multitude of banks or credit unions for account holders to choose from…all within driving distance of their homes. In addition, dozens of investment firms can provide account holders with alternative investment products, along with a checking account. Unfortunately, many financial institutions rely on serendipity when it comes to account holder acquisition. They think if they have a branch location somewhere along account holders’ work or Saturday errand routes, then new account holders will come. However, you shouldn’t take a “maybe” approach to account holder acquisition. Instead, be strategic and aggressive when it comes to growing your account holder portfolio. When acquiring new account holders, you should always promote new checking accounts. Surprised? 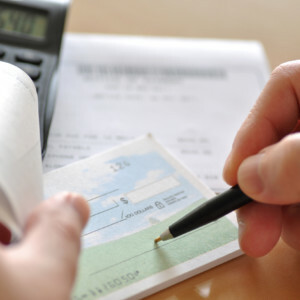 Everyone needs a checking account to manage finances. Checking accounts will likely appeal to those who are new in their careers or have recently moved into the area because of a job. They may also appeal to account holders who are generally dissatisfied with their current financial institution and seeking a new banking relationship. What was the reason for opening a new checking account? A checking account provides approximately $268 a year in revenue to a financial institution.1 It also opens the door to that new account holder acquiring more products and services as his/her relationship grows with the primary financial institution. Take the time to target account holders with whom you have a likelihood of establishing strong relationships through cross sell opportunities to gain strong share of wallet. Financial institutions have a wealth of account holder data at their fingertips that can be used to profile existing checking account holders. They should use that information to target “lookalikes” in their market footprint. 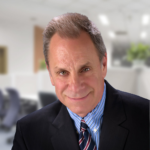 Ensure that you reach young account holders opening new checking accounts through mediums and messaging that resonates with them to build strong awareness of your financial institution and its products. Branch locations still play a large role in the banking relationship. 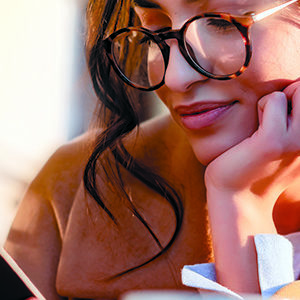 Be sure to include messaging about the convenience of banking with you – whether it is access through a branch, ATM or digital banking options. How likely are you to obtain another checking account in the next year? Which features were most important in choosing a financial institution when you recently opened a checking account? A consistent, multichannel approach works best when marketing to prospective account holders. Nearly a third of prospects cite direct mail and digital ads as the strongest vehicles a financial institution can use in order to make them aware of a product opportunity. Finally, don’t forget to make an attractive offer when promoting a checking account. Many financial institutions are actively targeting new checking account holders.2 In some cases, the offers are rich (as high as $500). Don’t let this intimidate you. The “Davids” of the banking world can go up against the “Goliaths” by relying on offers that will get noticed, even $50 to $100. Community roots, consistent communications and targeting will help ensure your marketing dollars are spent as effectively and efficiently as possible. 2. The Financial Brand, 2015 State of Bank & Credit Union Marketing, February 3, 2015. 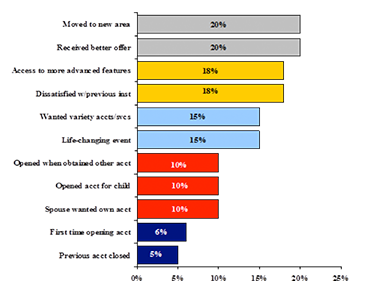 Several factors impact a consumer’s decision to open a new checking account. In fact, the decision process varies as widely as account holders themselves. One characteristic, though, seems to cut through all the others, regardless of demographics. Financial institutions need a strategy that identifies the best checking prospects, successfully targets them, and captures their attention with a strong incentive. 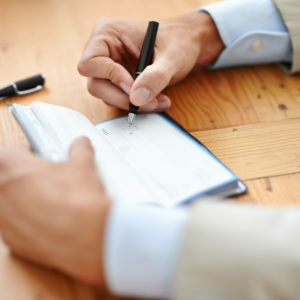 Here are three ways to attract and obtain more checking account holders. From Amazon Effect to Amazon Invasion — Is Disruption Imminent? Maybe you’ve heard the news that Amazon® is considering offering a checking account with a monthly fee of $5 to $10. No big deal, right? They’ll even throw in cell phone protection, ID theft protection, roadside assistance, and more. Got your attention? It should. It certainly has the attention of your account holders.